In response to a call for comments regarding the drafting of regulations implementing the California Consumer Privacy Act of 2018, CHIA has recently provided written comments to the California Department of Justice . 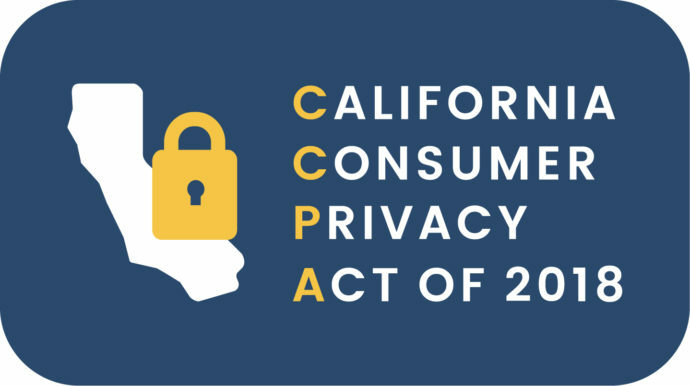 Assembly Bill 375, which will be known as the California Consumer Privacy Act (CCPA), was signed into law by Governor Jerry Brown on June 28 last year and is scheduled to go into effect on January 1, 2020. The act gives consumers groundbreaking new rights with regards to controlling their personal information collected, held, and used by businesses. As required by California administrative law, The California Attorney General has begun the rule making process to implement the act, the first step of which is to make the public aware of the CCPA and to seek public input into the rule making process implementing the act. Toward this end, a series of public forums were held throughout California between January and March of this year seeking comments from the public. Sharon Lewis MBA, RHIA, CHPS, CHPQ, FAHIMA, CHIA CEO/Executive Director and Brian Faust MLS, RHIA, CHIA Past President attended two of the forums. In early February the CHIA Board of Directors appointed a limited duration Task Force to evaluate the CCPA, to brainstorm regarding its potential impact on health information management, and to draft formal written comments to forward to the Department of Justice. Lesley Kadlec MA, RHIA, CHDA from AHIMA and Lauren Riplinger JD, Senior Director, Federal Relations for AHIMA, contributed to the efforts of the Task Force. A special thank you to the following CHIA members for their participation in this process: Kritsin Bumroognchart, MPH, RHIA, CHPS; Morgan Hezlep, JD, CHC, RHIT, CHPS; Brian Faust, MLS, RHIA; Vivian Thomas, RHIA, CHDA, CPHQ, CHPS, CDIP; Esther Tolentino, RHIT, CPHI, CHTS-IM, CHTS,-PW; and Debi Primeau, MS, RHIA, FAHIMA, AHIMA State Advocacy Liaison. The California State Legislature began a new two-year legislative session earlier this year in January. As always, legislators had a February deadline to introduce bills for the session, and like most sessions, it was a task the legislators undertook with gusto. A total of 1,822 Assembly bills and a total of 786 Senate bills were introduced by the February 22 legislative deadline this year. Using the “StateTrack” application provided by AHIMA to Component State Associations to assist with identifying and monitoring state legislation around the U.S., several dozen California health care related bills were identified to review for their potential impact on health information management. While the review of bills identified by StateTrack is still underway, an initial list of twenty bills has been identified and assessed has having potential implications for health information management, HIM professionals and/or related professional areas such as revenue cycle management. 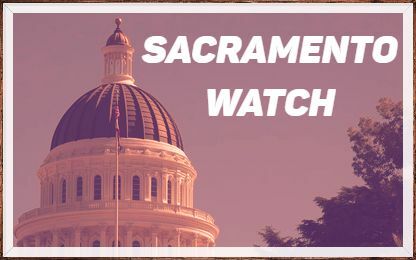 The CHIA Legislative and Advocacy Committee, as one of its committee charges, will be monitoring these and any additional California bills of interest identified on an ongoing basis as the legislative session proceeds over the next two years. The CHIA bill list and future updates to it are also available for CHIA members to access and use. The list is available on the CHIA Legislation and Public Policy webpage . For members who would like more detailed or more up to date information on any listed bill, the California State Legislature maintains an excellent, easy to navigate website at leginfo.legislature.ca.gov , all that is needed to navigate on the site is the bill number. CHIA is celebrating 70 years of service to the health information management (HIM) profession. Join HIM professionals in beautiful Indian Wells for the 2019 CHIA Convention & Exhibit - Empowering Patients, Breaking Boundaries, and Bridging Gaps. Celebrate CHIA’s 70 years of success while shaping its future! Discover innovative ideas and strategies for tackling day-to-day issues as leading industry experts discuss challenges facing today’s HIM professionals in electronic health record best practices, patient access/release of information, compliance, organizational leadership and management, data integrity, clinical documentation improvement, consumer/patient engagement, coding, compliance and more. Register by May 8 and Save! or the Convention Schedule At-a-Glance . Provided are excerpts from the March/April CHIA Journal . 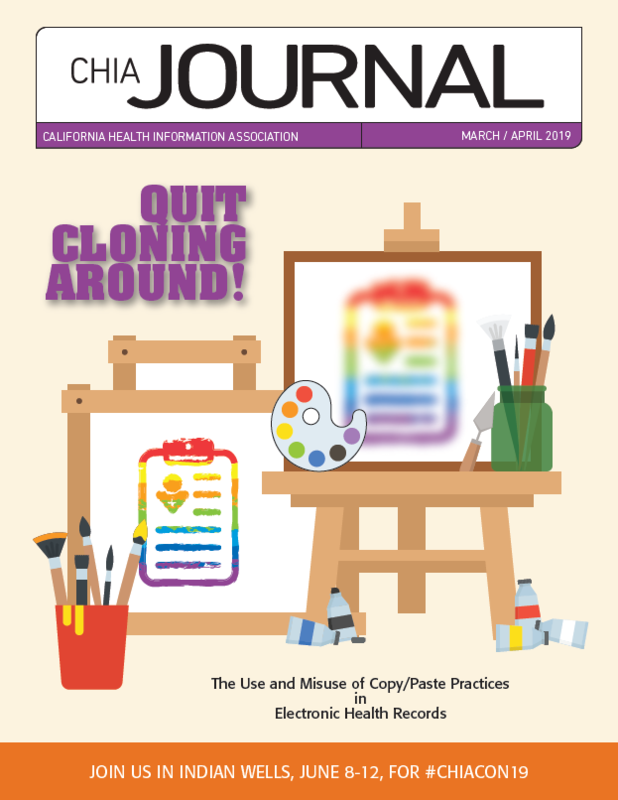 CHIA members receive a mailed hard copy, and all CHIA and AHIMA members can access the digital version online to view, read, and enjoy now! The French mathematician and philosopher Blaise Pascal once wrote, “I have made this letter longer than usual, only because I have not had the time to make it shorter!” The practice of cloned or copy and pasted documentation is a significant issue in the use of electronic health records (EHRs). A recent study in the Journal of the American Medical Association found that of thousands of progress notes examined by researchers, just 18 percent were newly entered by clinicians (Wang, 2017). of Standards and Technology (NIST) concluded “current implementation of this [copy-and-paste] functionality has introduced overwhelming and unintended safety-related issues into the clinical environment” (NIST, n.d.). Also, the overuse or abuse of the copy and paste feature of an EHR is a growing area of focus for government auditors. Read full article . CHIA is looking for articles on a variety of timely educational topics that represent the depth and breadth of HIM roles and interests, and can include tips, strategies, techniques, case-studies, opinions and commentary to be included in the peer-reviewed CHIA Journal . CHIA encourages members, Corporate Partners, educators, and HIM professionals to submit articles and share their knowledge with CHIA readers. Learn more or submit a article here . CHIA is partnering with the Health IT Summit to offer complimentary passes to CHIA members . Use code CHIACOMP when registering. Join top executives, physicians, practice management and IT decision makers from North America’s leading provider organizations and physician practices in San Diego, CA for a two-day executive Health IT Summit. We've developed a concise program where leading healthcare thought leaders interact with their fellow executives and solution providers to discuss the latest strategies and tactics to address a wide range of issues and topics, including: data security, population health, data analytics, accountable care, telemedicine, and more. This exclusive, high-level program is a great opportunity to stay ahead of the challenges we all face and to network with other healthcare leaders and colleagues. Are you a coding professional interested in learning about clinical documentation improvement (CDI)? Are you a retired nurse or a nurse who wants to explore other career options? There are enormous needs in the health care industry to become a CDI Specialist where you will assist physicians to accurately document how truly ill patients are with severity ratings. The trend nowadays is quality documentation and this course will teach you how to achieve this. RN Link is offering a 10% discount to CHIA Members . ​ Learn more and register today ! Celebrate the 30th Annual HIP Week, March 24-30, 2019! You’re invited to join the celebration and be recognized for your contributions to the HIM profession during the 30th annual Health Information Professionals Week (HIP) Week, which coincides with AHIMA’s Hill Day, where AHIMA members come together on Capitol Hill to advance the health information profession. HIP Week is a great opportunity for professionals to showcase the benefits of their profession, and collectively work to lead the way in health information. Help spread our message with pride by participating in HIP Week and using #HIPWeek19 in your social posts! AHIMA and State Leaders from across the country will be at Hill Day on March 26, talking to legislators in Washington, DC, about public policy issues that affect HIM. Now you, too, can participate in the advocacy activities – virtually! Join AHIMA and State Leaders by registering for a free informational webinar presented by AHIMA to learn how you can be a voice for the health information management (HIM) profession. In this virtual event, AHIMA's government relations team will explore the public policy issues AHIMA is focused on before Congress. Attendees will also learn how to contact their elected officials via phone, email or social media with a comprehensive walk-through of AHIMA's Advocacy Action Center. the Centers for Medicare & Medicaid Services (CMS) is announcing a free on-line training course in infection prevention and control for nursing home staff in the long-term care setting developed with the Centers for Disease Control and Prevention (CDC). The course information covers core activities for an infection prevention and control program, with a detailed explanation of recommended practices to prevent pathogen transmission and reduce healthcare-associated infections and antibiotic resistance in nursing homes. Read Notice. The U.S. Department of Health and Human Services (HHS) recently proposed a new rule to support seamless and secure access, exchange, and use of electronic health information (EHI). The proposed rule is designed to increase innovation and competition by giving patients and their healthcare providers secure access to health information and new tools, allowing for more choice in care and treatment. It calls on the healthcare industry to adopt standardized application programming interfaces (APIs), which will help allow individuals to securely and easily access structured EHI using smartphone applications. Learn More.